One of my unspoken (and unwritten) September Resolutions, was to spend a bit more quality time together as a family. 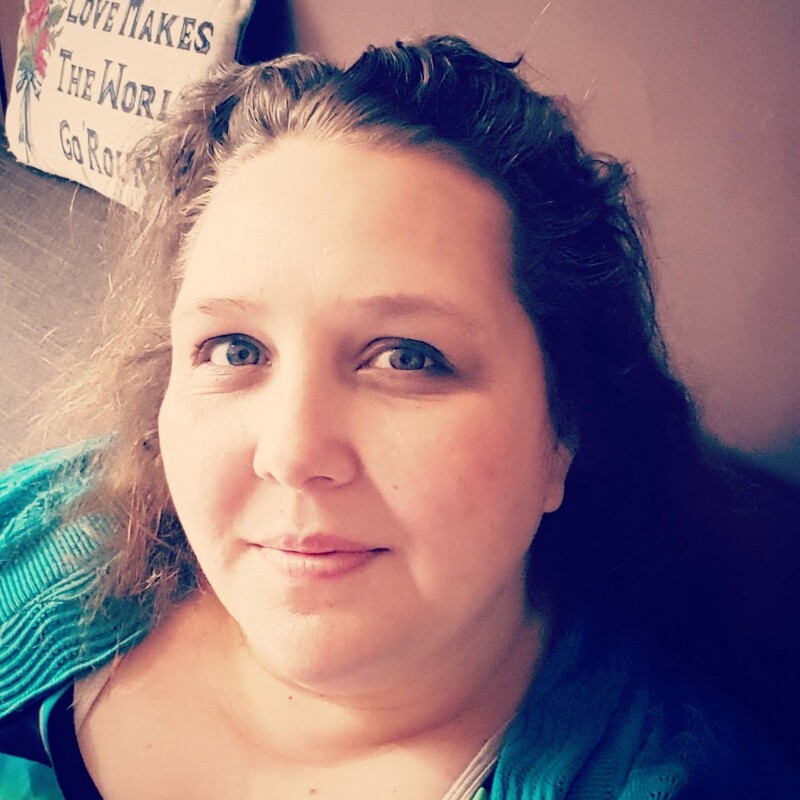 I mean sure, we spend a lot of time together, but I don't mean the time where we're in the same room and talking but each of us doing our own thing. I don't mean the time where the children bundle into my bed and annoy me until I end up wrestling them into submission and ordering them back to bed, I mean REAL time together. 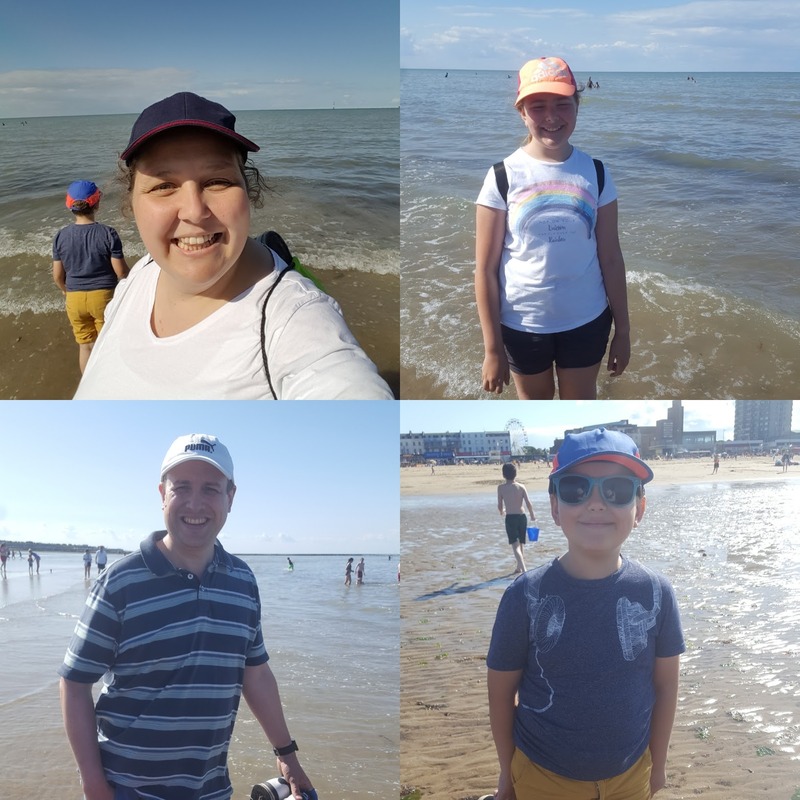 The "Spend-all-day-together-as-a-family" time, like the time we spent at Margate. 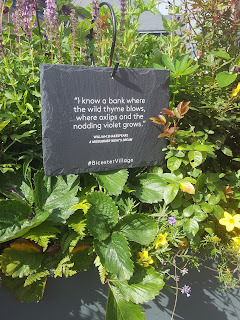 Luckily Flyfour and the children felt the same and so we were able to think up some plans for different things that we wanted to do together, which is why a few Saturday's ago we went to Bicester Village. 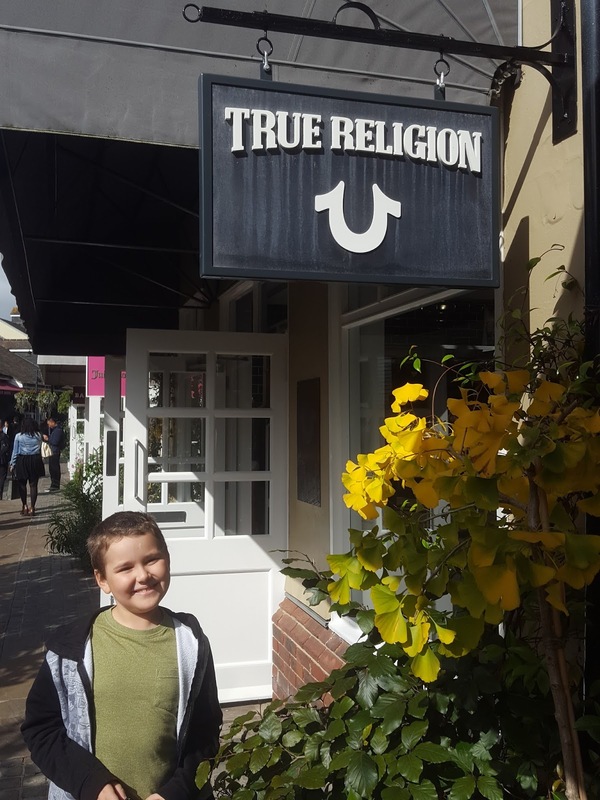 The main reason we went, was because both Top Ender and Flyfour were after some new shoes and we'd decided that the Clarks at the outlet centre were probably a good place to start, as a few friends of ours had been recently for back to School shoes and got some great bargains. Tops didn't find any shoes, but Flyfour did so the mission was half accomplished! The other reason we went was that we had never been before and wanted to experience it for ourselves and of course to enjoy time together! If I am perfectly honest, the village isn't to my tastes. I'm not a fan of designer wares mainly because being the size I am nothing fits. The other problem is I object to paying as much as my families weekly shop on a T-shirt, a handbag or whatever else it is. It was fun to walk around, to window shop and to pretend we could afford all the different bits and pieces we saw that were way out of our budget. My Mum made a quick stop into the Pandora store, where she purchased a couple of charms. They were ones she'd had her eye on and so knew the value of them and apparently they were a good bargain. We decided to eat lunch in Pret a Manger, which was good as the Salads were Gluten Free and everyone was able to pick what they wanted. It was super busy, but we found a table quite easily and we all enjoyed the food. I think I'll have to add a Pret lunch to my treat eats every so often because everyone agreed that what they had picked was really tasty! When we saw there was a Superdry, we knew that Top Ender was going to want to have a look inside. And it was here that I found a rack with up to 70% off for one reason or another and a brilliant dress and a playsuit which I knew Tops would love. 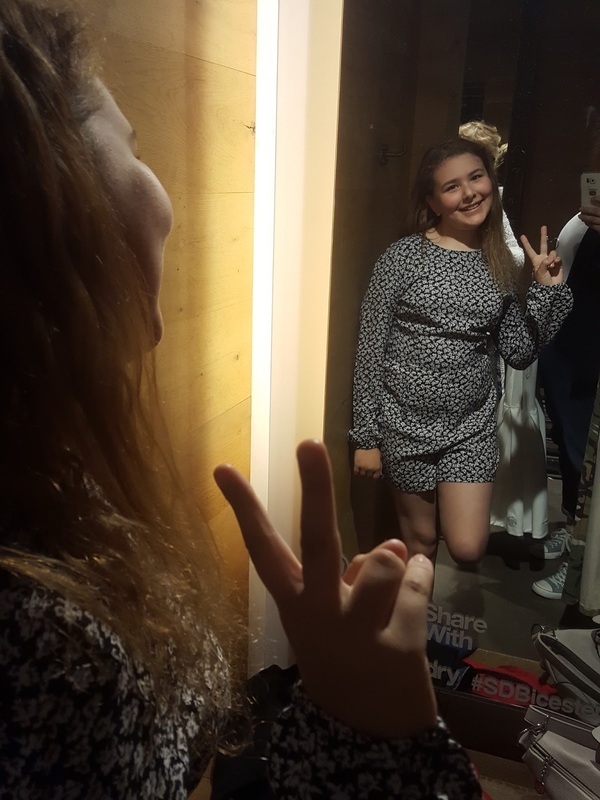 The playsuit was nice, but wasn't right for Tops and the dress had a black mark on it which we knew would wash out, but still got us a further 1/3 off the price and gave Tops a lush dress to wear to Church, as you can see in this Instagram Post. I love my Mum for asking for that extra discount! 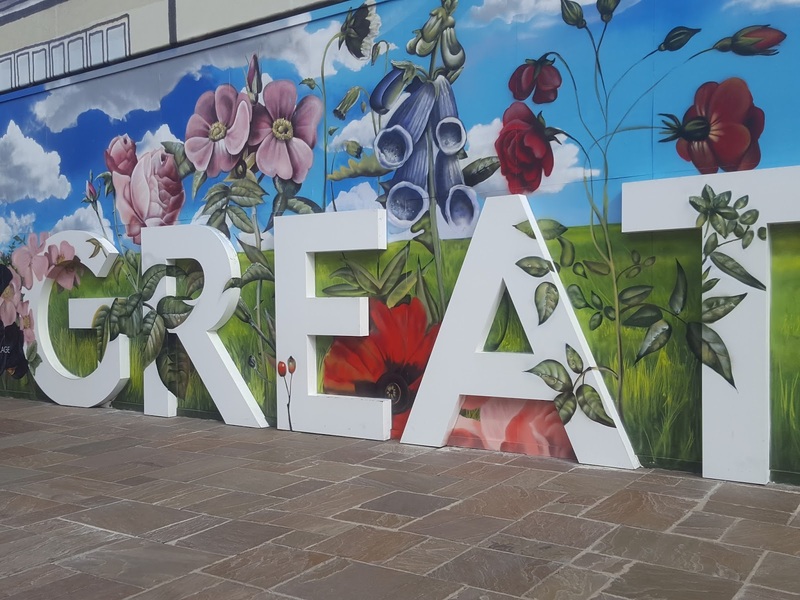 One thing that I did love about the village, was the obvious care that has been put into the art that is around the village. 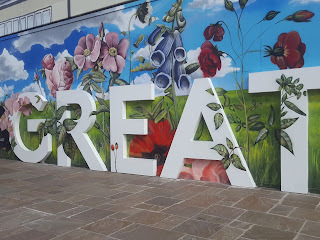 There was a great Graffiti installation which I'd love to have replicated in my garden, although I'm not sure I'd be able to replicate it or afford it. 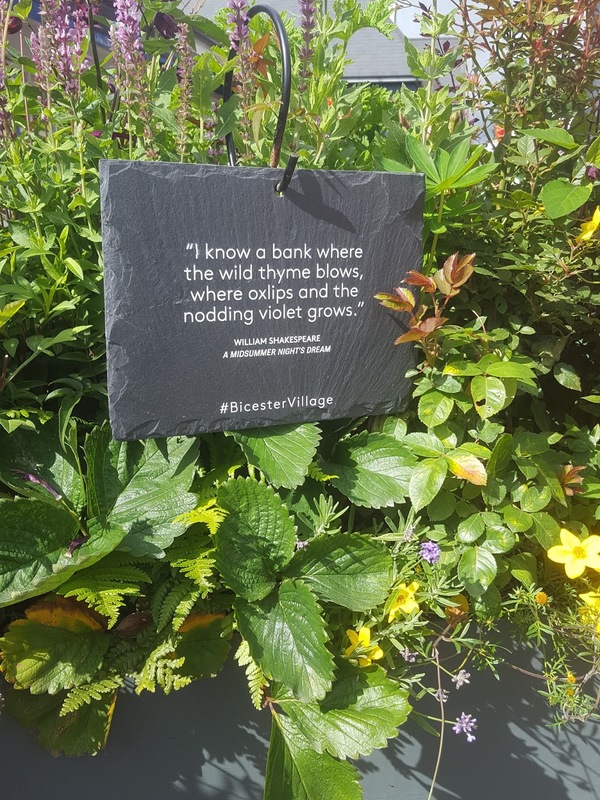 There were plenty of quotes around on slates hidden in the flower beds, which Dan Jon loved looking for, as he was hoping there would be one from Richard III, but instead we could only find one from A Midsummer's Night Dream. Again, it's something that has sparked an idea for our own garden. As Bicester Village isn't exactly too far from us, I'm sure that we'll be back in the future and who knows maybe I'll be a millionaire when we go back and I'll be able to afford the really cool handbags that we saw... everyone needs a Pac-Man handbag right?